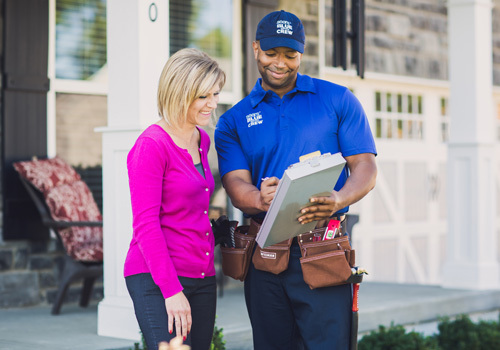 If you need assistance with minor to intermediate repair jobs in your home, look no further than a Sears handyman technician. We are experienced in a variety of tasks like deck building and plumbing repairs. Maintenance in your home is important and can take a lot of time and effort to complete. Renovation and repairs are continuous jobs that may require help from an outside source like Sears Handyman Services. Give us a call at (740) 833-3347. It can be troublesome dealing with issues like broken pipes and leaking faucets. Usually, these problems need to be tended to immediately. If you want to avoid water loss and an increased water bill, call Sears Handyman Services. Our technicians can provide you with a flexible and affordable solution to all your minor plumbing issues. Don't let the following repairs turn into a catastrophe. Trust our expert staff instead. Our handymen are capable of replacing and repairing ceiling fans and other light fixtures. You don't need a professional electrician when our employees can help. If a task is too difficult to complete yourself, then take advantage of our electrical repair services. At Sears Handyman Services, we can even install LED and recessed lighting. If you need major or minor repairs done to your drywall, call Sears Handyman Services. We can repair, tape, and patch existing drywall or start over with fresh material. Many interior walls are constructed with drywall. It's portable and sturdy but it's also prone to cracks and breaks. Our technicians are standing by to help with these tasks, and more. Having a barbecue on a relaxing summer day can be fun, especially if you have a deck. Maintaining a deck, however, requires plenty of attention and effort. For any deck maintenance or repair, just call our handyman technicians for help. If you have been dreaming of a new deck, need help with wood rot damage, need deck staining services, or help preventing water damage, Sears Handyman Services can help. If you want to mark your property line, enclose your yard, or gain a little extra privacy, a fence is a great way to do that. Sears handyman technicians can help improve your home by providing fence installation services for privacy or picket fences. If you're looking for something with a little more economic value, consider a chain link fence. Painting your home can give the interior and exterior new life, but it's a job that takes a lot of time to complete. It can be troublesome for some homeowners to use ladders and reach tall walls and high ceilings. On top of all that, it can be a pain to rip off old wallpaper in preparation for new paint. To help you with these various painting tasks, among others, contact Sears Handyman Services. We can have every inch of your home looking revitalized in no time.